The internet doesn’t need more kale recipes. I almost didn’t post this for that very reason, but then my husband reminded me the internet wouldn’t exist without unnecessary and redundant information. And I’m not posting kale recipes because it’s trendy. I’m posting kale recipes because it’s all I grew this summer so it’s all we eat. Seriously. All my meals are kale-based some days — including breakfast — so I guess we’ll start there. 1. Remove kale from the stems and roughly chop or tear leaves. Then rinse and spin or pat dry. 2. Heat bacon until crispy. Drain grease from bacon, saving 1/2 T. of grease for the dressing. Chop bacon and set aside. 3. In a small bowl, mix the vinegar, maple syrup and bacon grease until incorporated. 4. In a large mixing bowl, toss kale with the dressing. Use your hands to massage it lightly, evenly covering all the leaves. The kale should turn slightly brighter green and be a little shinier, but it won’t be heavily coated. Kale will reduce from about 8 cups to 6 cups. 5. Fry eggs in butter over easy or over medium. 5. 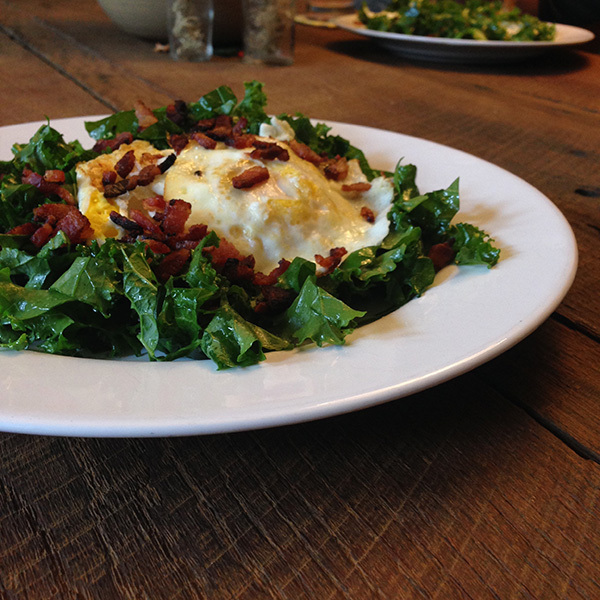 Split kale between two* plates, top with freshly prepared eggs and sprinkle with bacon pieces. *We eat a lot of kale. Obviously this can serve more people if you aren’t on board for cups of kale for breakfast… or any other meal. This is my go-to for lunch most days during the week, paired with a few ounces of chicken. And I still look forward to it every day. 2. In a small bowl, mix the vinegar, honey and olive oil until incorporated. 3. In a large mixing bowl, toss kale with the dressing. Use your hands to massage it lightly, evenly covering all the leaves. The kale should turn slightly brighter green and be a little shinier, but it won’t be heavily coated. Kale will reduce from about 8 cups to 6 cups. 5. 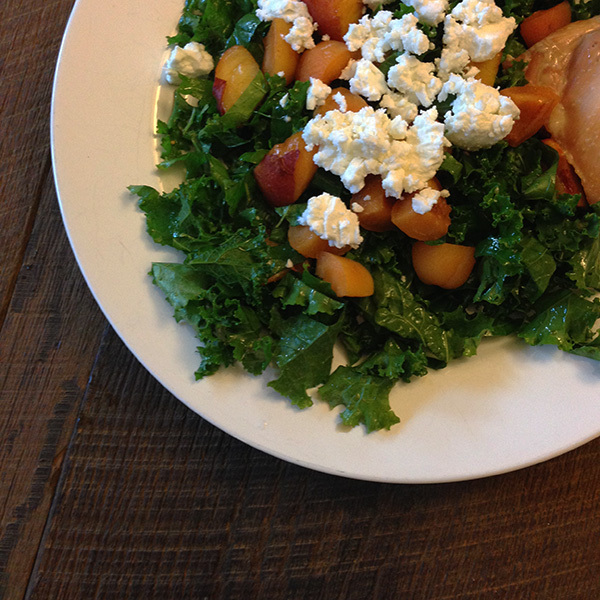 Split kale between two plates, top each with a chopped peach and an ounce of the crumbled goat cheese. This combo with honey kale and tahini dressing stems from my love affair with the Buddha Bowl at Ezra’s Enlightened Cafe in Broad Ripple. I can’t quite get their version right, but playing around with the flavors I like led to this, which ended up as a good thing. Combine all of the ingredients in a blender, and blend until smooth. Add more water to thin, if desired. 1. Place all ingredients except oil in a large bowl and knead together. Wrap in plastic and chill for at least one hour. 2. Remove meat from refrigerator and form the mixture into balls the size of golf balls (makes about 10). 3. Heat the oil in a skillet over medium heat. Heat until browned on all sides and cooked through. 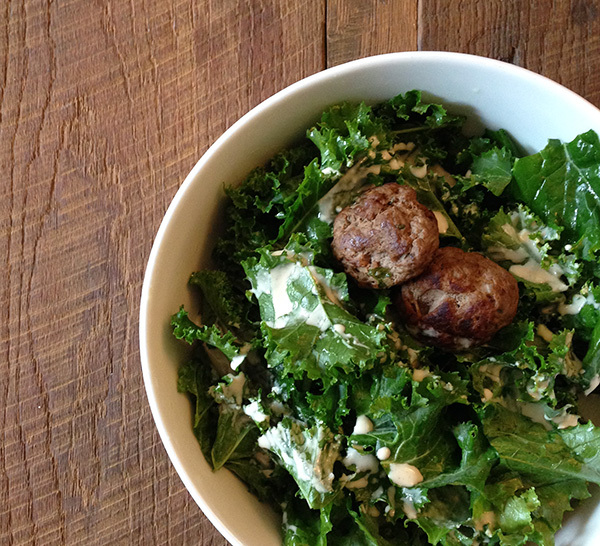 Split the honey kale between two plates and top with preferred amount of tahini dressing and kefta. 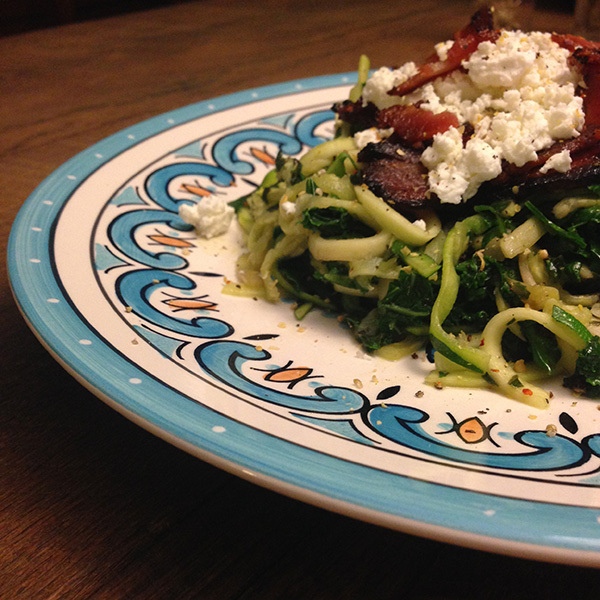 And if salads aren’t your thing, you can just shove lots and lots of kale into any other dish you are making — like zucchini noodles, my other obsession this summer. So good. What’s your go-to summer food? I absolutely love the Buddha bowl at Ezra’s as well and have been combing the Internet to find a recipe for the dressing! Can’t wait to try it. I will probably follow the honey kale recipe too becaus they go so great together.